A good toaster oven can make great toast at breakfast, broil a salmon fillet big enough for two for dinner or bake a small batch of cookies. One such oven is the Breville Smart Oven. It gets the high marks for even cooking and temperature accuracy. I have had mine for about two months and love it. I am so glad I purchased it. Toaster ovens run the gamut from $19.99 to this beauty at $300. I should never include with some at the lower price range. 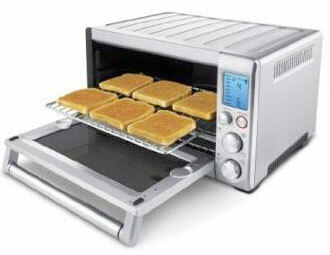 This is an oven/toaster/ defroster that would replace a microwave on a boat or RV.